Not feeling festive? You need a visit from Bill’s holiday spirits! These classic Christmas concoctions will warm the hearts of all the Scrooges out there. According to Andy Williams, the holiday season is the wonderful time of the year – a time filled with trimming trees, singing carols, and making memories with family and friends. But the hordes of shoppers, piles of presents, and an endless stream of parties can also be stressful. If you’re feeling overwhelmed by all of the holiday hoopla- you need a visit from some holiday spirits, and not in an Ebeneezer Scrooge, ethereal entities-kind of way. Check out these classic Christmas concoctions that will warm your body and spirit during these chilly winter days. This classic cocktail tastes great and is also a good way to recover from a winter cold – it’s a win-win! Heat water in a tea kettle or the microwave. Once warm, add a tea bag and steep for 3 to 5 min (follow directions on tea bag). While brewing tea, fill your mug with warm water. Once warm, dump out the water and coat the bottom with honey. Add the liquor and squeeze the juice from the lemon quarter. When the tea has steeped, pour it into a prepared glass and stir. Enjoy! Get your moose mugs ready for this traditional made-from-scratch favorite. Beat the egg yolks, 1/4 cup sugar, nutmeg, salt, and vanilla together until it is very thick and has a light yellow color. Slowly beat in the brandy and milk. Cover and chill overnight in the refrigerator. Shortly before serving, beat the egg whites to soft peaks. Gradually beat in remaining 1/4 cup sugar and beat this mixture to soft peaks again, creating a meringue-like cream. Slowly pour this cream over the chilled brandy mixture, folding it in gently. 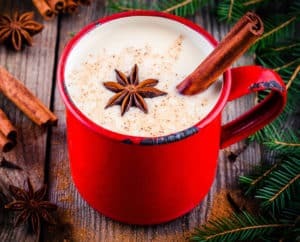 Serve the eggnog in a mug and grate nutmeg over the top for a garnish. Nothing says ‘holidays’ like the aroma of hot red wine, cinnamon, cloves and citrus. Combine the cider, wine, honey, cinnamon sticks, zest, juice, cloves and star anise in a large saucepan. Bring to a boil and simmer over low heat for 10 minutes. Pour into mugs, add an orange peel to each and serve. And there you have it! After a few of these festive holiday drinks, you’ll be out on your roof decorating your house, Clark Griswold-style, in no time! Whatever the occasion or whatever your taste, Bill’s Package Store has the right ingredients to make your holiday season a success. Bill’s Package Store offers superior quality, top-shelf brands of your favorite liquors at the lowest prices in Clarksville, TN. We’re conveniently located on Ft. Campbell Blvd and also open on Sunday’s from 10am-11pm! From spirits to wine, we’ve got something for everyone…21 and older! previous post: Be the best bartender this Halloween with drinks so good, it’s spooky! next post: Champagne! What it really is.